SAN FRANCISCO RED LIGHT CAMERA ATTORNEY, FRANCISCO RODRIGUEZ WAS A SPECIAL GUEST ON THE PETER B. COLLINS KGO RADIO TALK SHOW; "PUT AN END TO THE CAMERAS", MAY 2012. NOTICE TO DRIVERS Red Light Cameras are hearsay prosecutions that are run by private companies. Citizens across the states are being smacked in the face with these prosecutions and have no way to understand how to defend them. If you have one of these tickets you should hire an attorney - it would be very difficult for a lay person to successfully defend against these allegations. We are red light camera Attorneys and have been defending these cases for years!!! Always do a Trial By Declaration in any traffic case. Why? Why not? It Gives you two bites at the apple, gives you a look at the cops testimony months in advance of trial and it creates discovery issues against them. Serve it on DA/CA and a courtesy to cops (do this for all traffic cases). Ask for the moon. Ask for copies of contracts, software information, repair history, any and all foundational issues covered in 21455.1, yellow light information and all the other normal stuff we ask for in any criminal case. I am (this is a bit controversial and I would love to hear opinions on it) of the belief that serving the Informal Discovery Request (IDR) is useless. In the old days I was able to successfully get San Francisco traffic Judges, Oakland traffic Judges and other places to dismiss if there was a violation of discovery. Now, all that I seem to get is a continuance I can't remember the last time that I got a dismissal based on the lack of discovery on a traffic case (let's take a poll). So, based on this I have come to the conclusion that I am better off getting the info by other channels and catching them off guard (unprepared). If you ask for the stuff they may get it and come well prepared to meet all the anticipated objections. If you do an IDR then remember that failure to provide the information can result in sanctions per People v. Jackson (1993) 15 Cal. App. 4th 1197. VC 210 requires a clear photo be taken. I have always argued that the intent of the legislature, when enacting 210, was so that the trier of fact could decided if it's the Defendant beyond a reasonable doubt. So if the quality of video or pic is poor that is your winning argument. I have done it In-Lim or with an 1118 or at closing. If denied at any stage I renew at every stage. "(a) The limit line, the intersection, or a place designated in Section 21455, where a driver is required to stop, may be equipped with an automated enforcement system if the governmental agency utilizing the system meets all of the following requirements:"
Go down the list and make sure that if they fail to introduce evidence on any of the listed issues that you simply raise an 1118. If you think that the Court will allow them to re-open, then argue your 1118 but do not state the grounds and wait to closing argument - the court, I think, can still allow them to re-open but I think it would constitute a better abuse of discretion argument for appeal. 21455.7. (a) At an intersection at which there is an automated enforcement system in operation, the minimum yellow light change interval shall be established in accordance with the Traffic Manual of the Department of Transportation. The issue is: Is the cop a "qualified witness" to authenticate the biz record. I have had a cop testify that Red Flex flew him to headquarters and allowed him to view where the records are kept and how they are created. He also testified that he attended many meetings and training (these last two had nothing to do with the issue but over objection robe let it in)With that scintilla of evidence, Court allowed the docs in as biz records based on the cop's testimony. He did lie, I mean testify about how recent to my case he had been at headquarters to review the record keeping procedures as well as at the local office. Mind you this is the exception and not the rule. In every other jurisdiction that brings cops as a "qualified witness", that I have been in, they fail to qualify - did not make the trips to Arizona or local office.So, they should not allow the"Red Light Packet" in over ahearsay objection.The end result is that they cannot lay the proper foundation for video or pics and matter should then be dismissed. Lastly, they always walk in with the paperwork in hand, some robes have attempted to say that it is reliable, I say there is only two ways to bring it in 1) custodian or qualified witness 2) follow proper SDT procedures EC 1560 et. sec.. I have never had anyone argue that it is a public record, but I am sure I will run into it someday. Ever since the SCOTUS issued their opinion in Crawford, I have always argued that the introduction of the "Red Light Camera Packet" into evidence violatedmy client's rightof confrontation. I argue that the system's (red light camera) only purpose of existence is to prosecute and hence any and all documentary evidence is created in such anticipation and is therefore classic "testimonial hearsay". The Court's and CA/DA have argued that there is specific language in Crawford stating that Biz Records are not testimonial - true. However, this does not override SCOTUS definition of testimonial hearsay and that is what is controlling. I usually will tell the Court that, "I will pay one hundred dollars to anyone in the Courtroom who prove that the"Red Light Automated Systems"has any other purpose but to prosecute red light violators." Melendez-Diaz now supplements and reinforces this argument. Again, the purpose of this argument is to kill the foundation necessary to bring in the video or photo and, if you have a decent robe, you will get you a victory. You should always raise a Kelly argument on any camera case. The issue being if cameras, loops and wires are a new novel technique. More importantly, what is the software program that is used and is it acceptable in the relevant scientific community (this brings in a ton of more issues, discovery can be used very tactically on this). We did a three day hearing in San Francisco and have all the transcripts from those three days of testimony. For some reason in Red Light Camera cases cops seem to think, and Courts seem to allow, that they can argue points of law. This is not limited to RLC cases but has happened in many other traffic cases. However, I find it more prevalent in RLC cases. The minute you see this state the following: Objection theOfficer is but a mere witness, nothing more. To allow him to argue any point of law, is to allow him to practice law without a license. To allow him to argue is to involve the Court in a criminal conspiracy involving the unlicensed practice of law. I would also refer the Court toPeople v Dragomir, 136 Cal.App.4th Supp. 1. NOTE: USE THIS WITH CAUTION. NEVER PLEAD GUILTY TO A TRAFFIC CASE! Always set the case for trial, 40% of the time the cop/s won't show. Even when they do show, remember that we are always at an advantage because we know the Evidence Code and they Don't. On red Light camera cases I am sure that I have left out many other defenses but these are the primary ones. Hope this is helpful. An "automated enforcement system" is any system operated by a governmental agency, in cooperation with a law enforcement agency, that photographically records a driver's responses to a rail or rail transit signal or crossing gate, or both, or to an official traffic control signal described in Section 21450, and is designed to obtain a clear photograph of a vehicle's license plate and the driver of the vehicle. (a) A driver facing a steady circular red signal alone shall stop at a marked limit line, but if none, before entering the crosswalk on the near side of the intersection or, if none, then before entering the intersection, and shall remain stopped until an indication to proceed is shown, except as provided in subdivision(b). (b) Except when a sign is in place prohibiting a turn, a driver, after stopping as required by subdivision (a), facing a steady circular red signal, may turn right, or turn left from a one-waystreet onto a one-way street. A driver making that turn shall yield the right-of-way to pedestrians lawfully within an adjacent crosswalk and to any vehicle that has approached or is approaching so closely as to constitute an immediate hazard to the driver, and shall continue to yield the right-of-way to that vehicle until the driver can proceed with reasonable safety. (c) A driver facing a steady red arrow signal shall not enter the intersection to make the movement indicated by the arrow and, unless entering the intersection to make a movement permitted by another signal, shall stop at a clearly marked limit line, but if none,before entering the crosswalk on the near side of the intersection,or if none, then before entering the intersection, and shall remain stopped until an indication permitting movement is shown. (1) Identifies the system by signs that clearly indicate the system's presence and are visible to traffic approaching from all directions, or posts signs at all major entrances to the city,including, at a minimum, freeways, bridges, and state highway routes. (2) If it locates the system at an intersection, and ensures that the system meets the criteria specified in Section 21455.7. (F) Maintaining controls necessary to assure that only those citations that have been reviewed and approved by law enforcement are delivered to violators. (d) The activities listed in subdivision (c) that relate to the operation of the system may be contracted out by the governmental agency, if it maintains overall control and supervision of the system. However, the activities listed in paragraph (1) of, and subparagraphs (A), (D), (E), and (F) of paragraph(2) of, subdivision(c) may not be contracted out to the manufacturer or supplier of the automated enforcement system. (e) (1) Notwithstanding Section 6253 of the Government Code, or any other provision of law, photographic records made by an automated enforcement system shall be confidential, and shall be made available only to governmental agencies and law enforcement agencies and only for the purposes of this article. (2) Confidential information obtained from the Department of Motor Vehicles for the administration or enforcement of this article shall be held confidential, and may not be used for any other purpose. (3) Except for court records described in Section 68152 of the Government Code, the confidential records and information described in paragraphs (1) and (2) may be retained for up to six months from the date the information was first obtained, or until final disposition of the citation, whichever date is later, after which time the information shall be destroyed in a manner that will preserve the confidentiality of any person included in the record or information. (f) Notwithstanding subdivision (d), the registered owner or any individual identified by the registered owner as the driver of the vehicle at the time of the alleged violation shall be permitted to review the photographic evidence of the alleged violation. (g) (1) A contract between a governmental agency and a manufacturer or supplier of automated enforcement equipment may not include provision for the payment or compensation to the manufacturer or supplier based on the number of citations generated, or as a percentage of the revenue generated, as a result of the use of the equipment authorized under this section. (2) Paragraph (1) does not apply to a contract that was entered into by a governmental agency and a manufacturer or supplier of automated enforcement equipment before January 1, 2004, unless that contract is renewed, extended, or amended on or after January 1,2004. (a) A city council or county board of supervisors shall conduct a public hearing on the proposed use of an automated enforcement system authorized under Section 21455.5 prior to authorizing the city or county to enter into a contract for the use of the system. (b) (1) The activities listed in subdivision (c) of Section 21455.5 that relate to the operation of an automated enforcement system may be contracted out by the city or county, except that the activities listed in paragraph (1) of, and subparagraphs (A), (D),(E), or (F) of paragraph (2) of, subdivision (c) of Section 21455.5 may not be contracted out to the manufacturer or supplier of the automated enforcement system. (2) Paragraph (1) does not apply to a contract that was entered into by a city or county and a manufacturer or supplier of automated enforcement equipment before January 1, 2004, unless that contract is renewed, extended, or amended on or after January 1, 2004. (c) The authorization in Section 21455.5 to use automated enforcement systems does not authorize the use of photo radar for speed enforcement purposes by any jurisdiction. (a) At an intersection at which there is an automated enforcement system in operation, the minimum yellow light change interval shall be established in accordance with the Traffic Manual of the Department of Transportation. (b) For purposes of subdivision (a), the minimum yellow light change intervals relating to designated approach speeds provided in the Traffic Manual of the Department of Transportation are mandatory minimum yellow light intervals. So if you need a: San Francisco red light camera Attorney/Lawyer; Berkeley red light camera Attorney/Lawyer; Emeryville red light camera Attorney/Lawyer; Hayward red light camera Attorney/Lawyer; Newark red light camera Attorney/Lawyer; Fremont red light camera Attorney/Lawyer; San Mateo red light camera Attorney/Lawyer; San Rafael red light camera Attorney/Lawyer; Menlo Park red light camera Attorney/Lawyer; call us today! We have the legal experience to win your case. Call and speak directly with Attorney Rodriguez for a free case evaluation, (415) 378-4133. State Sen. Joe Simitian's multi-year effort to enact red-light camera reforms ended Friday with the governor green-lighting his latest legislative try. Senate Bill 1303 will establish statewide standards for the installation and operation of red-light cameras and make it easier to challenge unjustified tickets, according to Simitian's office. "I am extremely pleased that the Governor has signed this bill, which will help restore public confidence in the use and fairness of red-light cameras," Simitian, D-Palo Alto, said in a statement Friday. "Red-light cameras can be an important public safety tool, but they shouldn't be abused. This bill will establish important ground rules, ensure that if drivers get a ticket that they shouldn't have, they can contest the ticket easily. It will put driver safety, rather than the revenue, first." Specifically, the legislation will prohibit the use of red-light cameras to raise revenue and require that their location be based solely on safety considerations. In addition, warning signs have to be posted within 200 feet of an intersection being monitored by one of the devices. Drivers who want to clear a wrongful citation also will no longer be required to identify the person responsible for the violation. Simitian has tried for three years to introduce red-light camera reforms. He came close last year, but Jerry Brown ultimately vetoed the legislation, saying he felt local elected officials should oversee the use of the devices. To win the governor's approval this time around, Simitian amended the legislation to resolve a dispute currently before the California Supreme Court over the use of evidence collected by red-light cameras; it will no longer be considered hearsay and therefore admissible in a court of law. "I'm very pleased that we were able to get to 'yes' this year on this bill," Simitian said in the statement. The provision has drawn howls of protests from red-light camera opponents, who say the matter should be resolved by judges, not politicians. 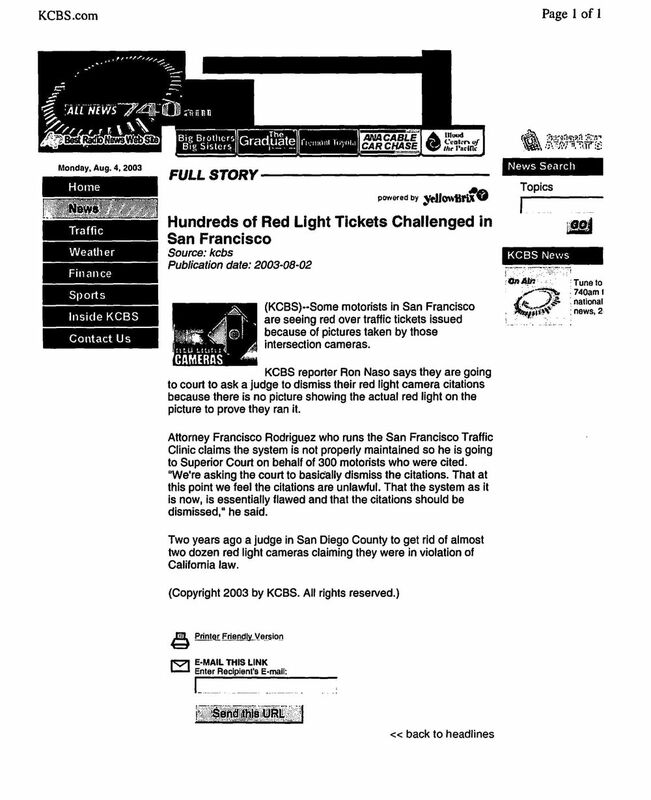 In an Aug. 30 letter to Brown, San Mateo-based defense attorney Frank Iwama said the hearsay language was "initiated, drafted and created" by camera vendor Redflex Traffic Systems. "It is extremely unusual that pending legislation is signed into law when a pertinent and critical legal issue is under concurrent review by the State's highest court," Iwama wrote in the letter. Simitian has brushed off accusations he introduced the legislation for the benefit of red-light camera companies. He reiterated Friday that the bill was inspired by San Jose resident Vera Gil, who experienced difficulty challenging multiple tickets from red-light cameras for a car in Southern California that she does not own and has never driven. After researching the issue, Simitian said he concluded that, "Vera Gil's experience was just the tip of the iceberg. The entire system cried out for reform." Most of the provisions of the bill will take effect Jan. 1, 2013.